A few weeks ago I moved into the Fillmore and have been enjoying it tremendously. I love the architecture, the views, the central location, the daily hum, the nightlife and the convergence of cultures from the jazz district, Western Addition, Japantown and Pacific Heights. Mostly, though, I appreciate the people. 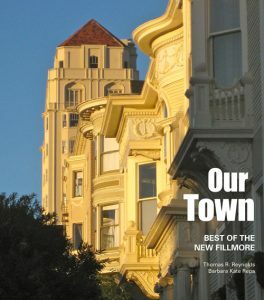 While looking at several San Francisco neighborhoods this summer, I was struck by the smiling faces on Fillmore. No other neighborhood I saw matched it. 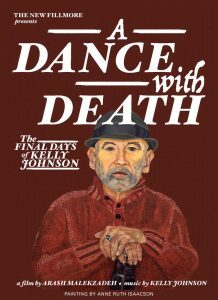 A clue to those smiles was in a recent edition of the New Fillmore. 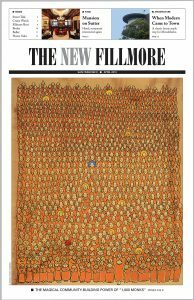 When I first moved into the neighborhood, my building had a small stack of New Fillmore in the lobby. I took one and read the whole thing as an introduction to the neighborhood. 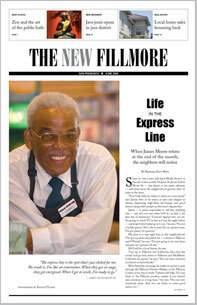 One article in particular stood out: “Life in the Express Line,” about James Moore’s retirement from Mollie Stone’s. According to the article, James Moore has done this not once, not for a year or two, but for a lifetime. I’m certain his warm greetings and genuine concern for the people he served have had a powerful, positive influence on the community. I’ll bet it’s a source of some of those smiles I’ve seen on Fillmore. I hope that, even in his absence, his example will continue and spread. In this hope I posted your article at USF for my students to read. Thank you for your write-up. And thank you, James Moore, for your story.